Well, we’ve all had to say goodbye to something in our lives that we hold dear, right? And usually, we expect to get sympathy or compassion in those instances, which would be an appropriate response. Except that it wasn’t quite the case with one netizen, who poured his heart out in a post saying goodbye to his beloved e-scooter. Oh wait, we left out one important point. His beloved illegal e-scooter, which was recently confiscated by the authorities. 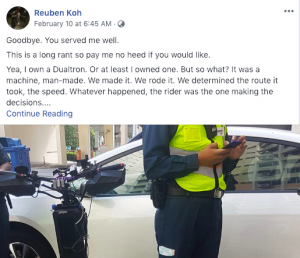 Reuben Koh wrote a 1006-word lament concerning his confiscated e-scooter, and if he was looking for sympathy, he must be greatly disappointed. 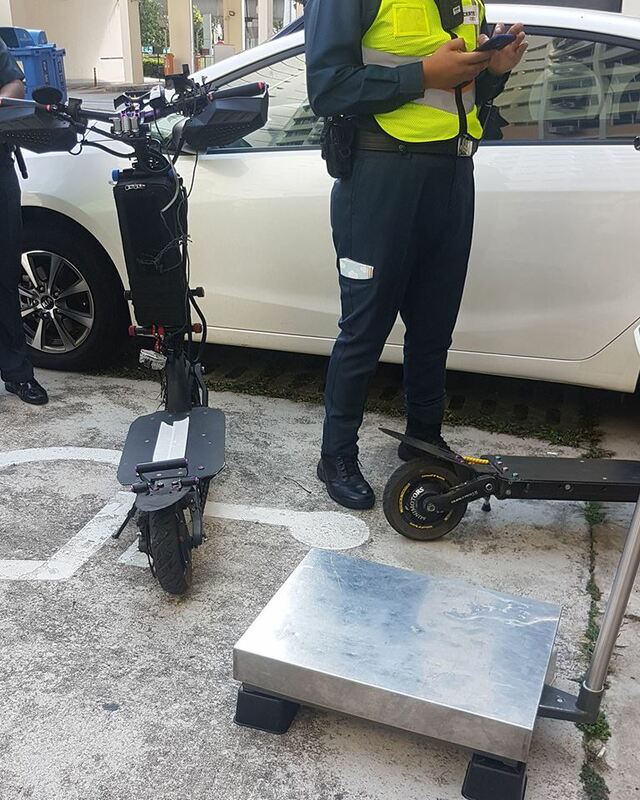 Koh explained that he owned a Dualtron, a machine that is commonly heavier than the 20kg weight allowed for e-scooters. First, he goes into great detail of how law-abiding he was. That he “never once knocked down someone,” nor “rode recklessly.” He used his lights and mirrors properly, and even had handguards with lights to warn people of his approach. He used his helmet and camera. But then, Koh also goes into detail about how he had “speed demon moments,” wherein he showed off. But only in places with no crowds. Moreover, he also talked about times when he “beat a red light, or rode across the road early when I wasn’t supposed to.” But according to him, no driver he knows has been penalized for this. Then he goes into the cost of the DT, which was “about $1700” of his “hard earned money,” that no one, no even his parents, who are divorced, helped him with. And then he goes into his personal problems with his parents, both of whom he says he cannot live with. Koh is a self-supporting student as well as a GrabFood driver and recently started a small e-commerce business. Therefore, getting his e-scooter confiscated affects his income and his jobs. His main point is that although he drove “a device that didn’t fufill the criteria of LTA’s imposed laws” he felt that this was justified for his particular situation. 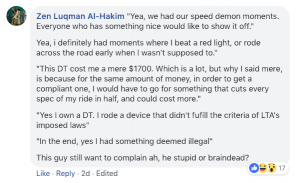 For Koh, he is the victim in this situation, and other riders, who are far more reckless than him, were allowed to get away with it. “In the end, innocents like us delivery riders who use non compliant rides for the sake of affordability and worth get caught under the crossfire of the law made to go against errant riders but we face the brunt of the punishment while those who are meant to get caught scoot off freely. I have seen 13 and 14 year old kids on Dualtrons riding at full speed in PCN. Nothing wrong with that, except it’s 3 in the afternoon and the PCN is flooded with humans. These kids ride around with their faces barely above the handlebar going around unsteadily at 50kmph with their sweaty hands and shaky handlebars. Yet we riders who use these devices as ways of income due to certsin situations that require us to work in this line due to the better perks it provides are the ones most often risking getting caught. Great job. CNY gift from LTA to me, was not being able to work, and losing the machine that allowed me to bring the most amount of money back, for what I need to survive. And others accused Koh of being a humblebrag. Such comments did not seem to bother Koh, however. As of February 13, his post, which had been put up on February 10, was still up and has been shared more than 600 times.